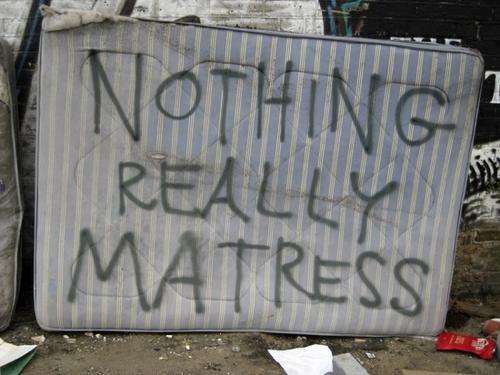 Should that be the headline of every mattress ad ever written? Seriously, think about that for a second because most consumers have absolutely no idea how important it is to sleep on a comfortable mattress. It’s important because the right mattress will give them the restorative sleep they desperately need. You think I am being too dramatic? Consider the following. “According to the National Sleep Foundation’s 2005 Sleep in America poll, 60% of adult drivers – about 168 million people – say they have driven a vehicle while feeling drowsy in the past year, and more than one-third, (37% or 103 million people), have actually fallen asleep at the wheel! … The National Highway Traffic Safety Administration conservatively estimates that 100,000 police-reported crashes are the direct result of driver fatigue each year. This results in an estimated 1,550 deaths, 71,000 injuries, and $12.5 billion in monetary losses.” Read more about that survey here. My question to you: do we do enough in the mattress industry to shine a light on the problem? We don’t talk about it in ads or in the store, and it is seldom, if ever, even featured on our websites. Do you think that I am stretching here on the connection of bad sleep to the mattress? We are quick to say that a good mattress can help you sleep BETTER, increasing your quality of life, so why isn’t the counterpoint to that also true? Remember the last time you slept on a really bad mattress? How did you feel the next day? My good friend and co-worker John Walsh is always telling me that the four key emotional drivers to the sale are fear, greed, guilt, and exclusivity. We talk about selling with emotion all of the time in this blog and fear is a very strong emotion. You can tell me all day long that I am going to feel better as a result of buying a new mattress and you will make an impact. You can also tell me that if I don’t pay attention to my sleep health it could cost me my life. See the difference? What do you think – should we be playing the fear card more? Do we as an industry do enough to make consumers aware of the downside of not buying a new bed? Tell me in the comments. On a side note…this weekend is Easter. My faith is a big deal to me and this holiday is one of the biggest. It is easy to let the Easter bunny and the egg hunt over power the reason for the holiday so I encourage you to take a few minutes and give some thought to the real meaning. Blessings to you all and thanks for reading. ⟵What Can We Learn from the NCAA Championship? sometimes the fear factor wakes people up to the realities. we actually have a marketing piece that internally we call the “Yuck Factor sheet”, it simply shows what occurs in a persons mattress or pillow after only a few nights of use and no mattress or pillow protection. when soemone sees that simple sheet, i can tell you they take notice of some simple facts of life. mattress and pillow protection is all about creating that healthy sleep zone. Great approach, especially for what you guys do Marc. I know that we debated for a long time on putting a picture of a dust mite on one of our products but I think that is very effective. Thanks for the comment and for reading. The answer to your question, “Do we do enough in the mattress industry to shine a light on the problem?” The problem being the impact of poor sleep on safety – the answer is clearly, NO! You could have version two of this blog with statistics about the impact of poor sleep on chronic disease, such as cancer, heart disease, and diabetes, the answer would still be, NO! I think talking to customers about these impact of sleep deprivation would help upgrade the customer to spend more on their mattress once they are inside the store. I do not think that ads about safety and health would directly drive traffic to the store because most customers associates a new mattress with better sleep usually meaning less pain. I think pain/discomfort is the key driver to take action to purchase a new mattress. Safety and health are far less influential in the mattress buying initiation. Interesting point Bruce. I wonder who has really attacked the negative aspect of the fear factor when advertising. It would be interesting to see those results. It might not be an ad, instead maybe it is a section on a website. All I know is that I agree with you, it is not discussed enough! Thanks for reading. No your message is not too harsh Mark. I think promoting the “health” message has absolutely been the best thing for our industry. The problem is- the perception of our profession is holding the message hostage. I saw a post the other day on Yahoo that made my blood boil. The tag line read something like “The tricks that mattress sales people use”. There was a video with two ladies that clearly didn’t know a mattress from a futon and a futon from a monkey! Maybe you guys have seen it? I was so mad I was smashing the keys on my keyboard so hard I think when I hit the button to post my rebuttal I may have deleted the whole thing. But to answer your question Mark, I would say “YES” we are trying hard enough, but “NO” we are not winning the war! Real simple– I think we are preaching to the choir (ourselves) most of the time. The rest of the time the message is restricted to a small target audience that only absorbs it when they are ready to buy. The trump factor or message blocker, is all this external noise from rogue mediums (like that article just mentioned). People who don’t even have any stake in the game are causing havoc. Most of it is just clutter from jack A**es who need to print a story. But it’s hurting our image. We need to change the perception of our profession before we deliver the health message clearer. It’s hard to do that when the majority of businesses in our industry are not really using the most subtle and health conscious approach in their ads. The ads you see currently are mainly “price, price, price, buy me now, nobody beats me, blah blew blah”. It trains the customer to think that way, and we become a sitting duck for bad press. I feel that the manufacturers are doing their part to promote health whether it’s through their product or their marketing campaigns. However, when you get down to the front lines, the retailers just butcher it up. (Can we make an industry standard rule for no-cheesy ads?) Speaking on behalf of our business, we don’t engage in those kinds of garbage ads. Or commercials are subtle. We just use our family saying our branded tag line in what’s really just a 10 second doughnut at the end of the vendors 30 second canned spot. Plus I would much rather spend time reaching out to local clinics, MD’s, sleep labs, and health fairs. We need to be seen with this kind of company rather than with some crazies selling bottle rockets. Point blank—we need to stop selling mattresses and start selling sleep. Across the board!!! It’s possible that adding even more fear to the equation could simply create a sense of urgency, as I think you’re intending. But I worry it could have unintended consequences as well, such as perhaps causing people to jump into a decision that they will later regret, leading to even more fear in their purchase process the next time around. I like your thinking around that Mike and it is possible that they rush into something but if we educate them well in the shopping phase using sites like goodbed.com we should be able to minimize some of that. I simply look at nutrition and exercise as benchmarks here. Those two industries have become massive over the past decade and have positioned themselves well as pillars of health. They had a lot of help from the medical community, but the ran hard with that ball. Quality sleep is starting to get some respect and the Harvard initiative is going to help, but we are not there yet. There are two things for nutrition and exercise….you can live better with them, you can die if you don’t get them right. All I am saying is that from a macro perspective, getting people to realize that there is a SIGNIFICANT downside in ignoring your sleep health and the mattress as a tool to help you get there. Think fad diets for nutrition, new juicers, cook books, cooking shows, websites, packaged food like Nutrisystem, vitamin supplements etc. For exercise that eco system/equipment is a treadmill, gym membership, ab exerciser, training apps, Wi Fit etc. I don’t think it is that obvious for sleep. Create the pain and solve the pain but do something to bring ALL ASPECTS OF SLEEP to light. Most of our ad money is spent on product, price, promotion. So much opportunity to educate the consumer carefully so we don’t rush them into a decision that they will regret. Great article, Mark. It’s time we further incorporate the sleep health and wellness message into the industry. The mattress is a health product and should be marketed as such. This industry is in a perfect position to educate consumers on the critical importance of sleep and the real consequences of sleep deprivation – which need to be taken very seriously. Your proposed approach is valid and warranted.